These days of search engines sending out their little probes to discover everything make life hard for retailers. They are instantly vulnerable to buyers finding prices for a product that's lower than theirs. And producers find it impossible to hide giving one retailer a lower price than others. So what to do? 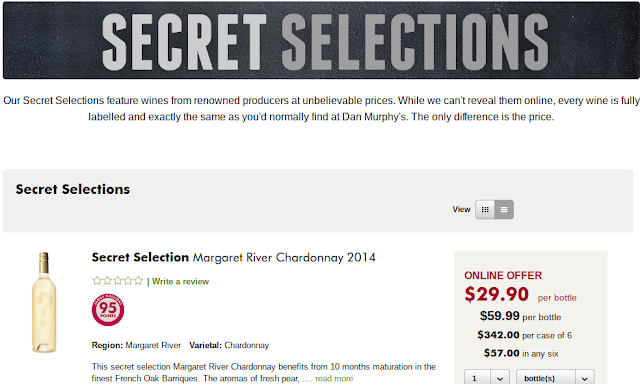 Those innovative wine marketers at Vinomofo found a way of avoiding both of those scrutinies. They came up with the idea of the Vinomofo black market where consumers were offered considerable savings on wines they would not know the name of until they were delivered. This version of buying sight unseen required quite a leap of faith on the part of consumers but Vinomofo somehow pulled it off and my friends expressed great satisfaction at buying good wines at much lower prices than offered at cellar doors. They came to quite like the Black Market idea and their enthusiasm has helped build a major wine retailer. Over at Dan Murphy's where a business has been built on not being undersold by anyone, the growth of this interloper was seen as a problem. How to undercut the price when you don't even know what the product to undercut is? In recent weeks it seems that the major force in Australian wine retailing has decided that if you can't beat them then join them. Dan Murphy is now offering what it calls its "secret selections". It has started offering its internet customers its own version of buying a pig in a poke. Dan will continue to build sales with this version of "trust me". Somehow I think that common sense will eventually prevail.